logo done by apemon :: send your logos to us and be a popstar ! Hope the pardey was great and you had a great time in Gdansk, Zerkman! Yeah! 4k with a nice chipzik and fullscreen effects, rules! next time 1 Meg pls..
Hm, that's cool for a 4k. 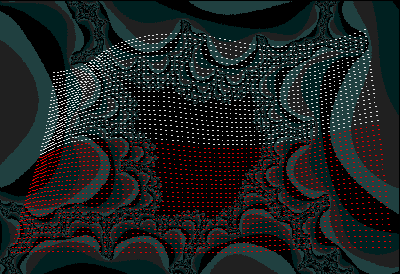 It's a pity to just display the fractal images without using them in a more imaginative way... But it's 4k, there is a music and a dot-flag effect. Nice as i said, but why 2Mb? Fullscreen code getting big or what? Nice as i said, but why 2Mb? Because the compo-rules allowed it so no one spent time on optimising it to run on 1MB ? He, he... Will convice him to do so on our small meeting here, the 23rd of fabruary (if he is there, in fact =). page created in 0.015717 seconds with 15 queries.